When the weather is hot and the air is humid that it makes my hands sweat and my feet puff out, the stove becomes my worst enemy and the oven, my bête noire. I avoid all temptations that might tickle my papilla. I turn off the TV and the laptop. I put away all food magazines, and restrain my self from reorganizing for the umpteenth time my cookbooks and recipe folders. I lunch on salads and fruits and brag about how I lost some more pounds. But when I can say, at least for most of the time, that I do restrain my self from eating too much; I wouldn’t say the same for cooking. And how can you do so when you were raised in a house where any event, and I mean any event, involves pans shaking, vegetables waltzing, bread mopping and a minimum of 15 people gathered around the table. As if it wasn’t enough to have the cooking syndrome in my genes, I married a man that smells, feels and guesses what is on the menu the minute he crosses the entry door. He gets as much excited as I do about a new recipe and some gorgeous vegetables at the market. And he always has the nice word that I like to hear at the end of the meal: “Thank you Honey! It was delicious". He is my kind of gourmand. Every time I spot a new recipe, adrenaline rushes inside my body making my eyes popping out of my head and my mouth water. I become amnesic as I instantly forget about all what I was doing at that exact moment and runs to the kitchen to start my experimentations. 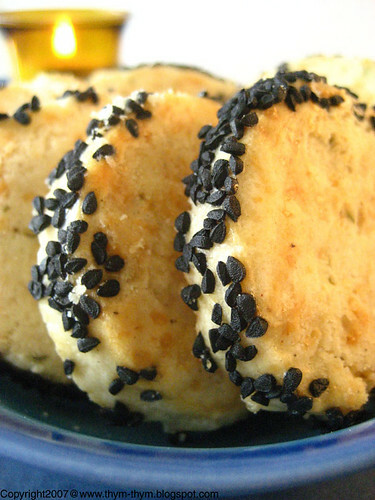 Ina Garten in one of her episodes made these Crackers using Parmesan and Black pepper. These crackers have more body than your usual crackers. They are very similar to shortbreads, crumbly and melt in you mouth. Her recipe calls to use one teaspon of thyme, which after baking won’t look enough. The thyme gets lost between the bolder flavor of both Parmesan and black pepper. You can use fresh thyme but I am guessing dried thyme or any other herb would work as well. I added to the crackers nigella seeds to add more crunchiness and as it bake the nigella seeds gives its smokiness that I just love. I generally use nigella seeds as a topping on my bread but I must say that this is another way where I will be using it. This is a very versatile recipe that you can twist and personalize as much as your inspiration goes. Because when it comes to cooking or baking, there are no rules, and certainly not the weather, that can stand against your passion and your genes. In a bowl, mix the butter until creamy. Add the Parmesan, flour, salt, thyme and black pepper and mix to combine. The dough will be sticky and very soft. Put the dough into a floured surface and shape it into a 13- inch long log. Wrap the dough and freeze it for 30min or until needed. You will still be able to slice it. Using a sharp knife or an electric knife, slice the log into ½ inch thick discs. Spread the nigella seeds in a plate and roll the border of each cracker, first in the egg white then in the nigella seeds. Arrange the crackers on a sheet pan, lined with parchment paper. Bake at 350F oven for about 20min or until the edges start to brown. Serve with a platter of cheese and grapes. Dans un bol, melanger le beurre mou jusqu’a ce qu’il devienne vremeux. Ajouter le parmesan, le sel, farine, poivre noir et thym. Melanger jusqu’a obtention d’une pate mollle et collante. Transvaser la pate vers une surface legerement farinee et former en boudin d’une longeur de 33cm. Envelloper la pate dans un film plastique et mettre au congelateur pendant 30min oujusqu’a ce que vous en aurez besoin. La pate ne se congelera as completement tant que vous l’utiliser le jour meme. A l’aide d’un couteau bien eguise ou d’un couteau elecrtique, couper le boudin en discs d’un centimetre et demi d’epaisseur. Mettre les graines de nigelles dans une assiette et rouler les bords de chaque biscuit, premierement dans l’oeuf battu puis dans les graines de nigelle. Arranger les biscuits dans un grand plateau, garni de papier fulfurise. Faites cuire dans un four prechauffe a 180C pendant 20 min ou jusqu’a ce que les bords des biscuits deviennent legerement dores. Ces biscuits s’accompagnent parfaitement avec un plateau de fromage et des fruits. I remember seeing these crackers on her show. Now I really want to try them out! Salted crakers are delicious, much better than peanuts once you've tasted it ! It's wonderful that you married someone who shares your passion for food. :-) These crackers look very enticing - esp the addition of nigella seeds make them even more appealing to the eyes and of course the taste buds. Isn't is gratifying to have a husband who shares your passion for food and compliments your cooking? Oh, these crackers are simply beautiful! Hope you made it through the storms ok. These are beautiful! But I guess my mind is stuck on sweets. When I saw the pictures, I thought they were chocolate-chip ice cream sandwiches! You had me guessing what those seeds were! I've never tasted Nigella seeds....now I'm curious. -Deborah, you should really try them. - Marion, thank you very muc for your nice words. I am glad you like them. - Patricia, the perfect nibble indeed. - Wendy, thank you. Let me know if you do try them out. - Hi Nora, I am indeed very lucky. Thank you very much for your kind words my dear Nora. - Claude, merci pour ton message. C'etait effectivement tres bon. - Anh, you are so sweet. I am so glad you like them. - Susan, my hubby is my biggest fan. Thanks a lot. - Shayne, Thank you very much. Yes, we made it. At least it is a great way to water my plants! - Anali, you are really stuck on sweet to think that it was ice-cream sandwiches. - Jaden, now you have to try nigella seeds! The Barefoot Contessa is one of my favourites. 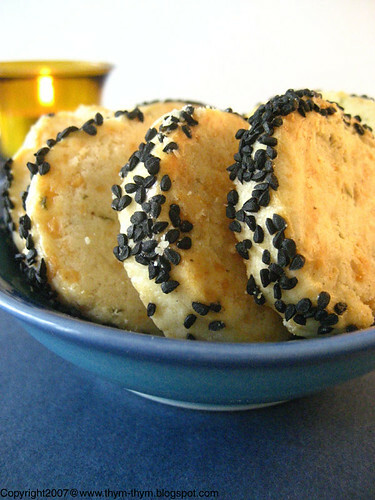 These crackers are a terrific idea for guests to "nosh" on before dinner. 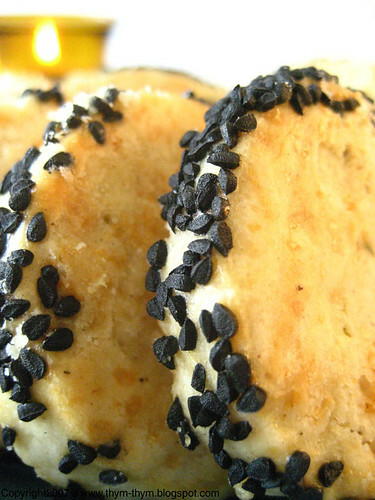 The close up pictures make them look like giant English muffins...yum! Lovely recipe, I love to make similar ones for Christmas baskets. - Thanks Valli. Ina Garten is actually the only foodnetwork "star" that I watch, along with Alton Brown. - Helene, this is a great idea.